Persistence Market Research (PMR) analyzes the automotive thermostat market in its new publication titled “Automotive Thermostat Market Global Industry Analysis 2013 – 2017 and Forecast, 2018 – 2026”. This study provides data for 2017 along with the forecast for the period 2018 – 2026. The main objective of the report is to identify the dynamics of the market and provide recent updates and insights that affect various segments of the global automotive thermostat market. To provide a better understanding of the automotive thermostat market, the report also includes the analysis of global drivers, restraints and trends, which influence the current market scenario and future status of the global automotive thermostat market over the forecast period. To understand and assess market opportunities and trends, the global automotive thermostat market report is categorically split into different sections based on market segmentation – by thermostat type, by vehicle type, by design type, by sales channel, and by region. 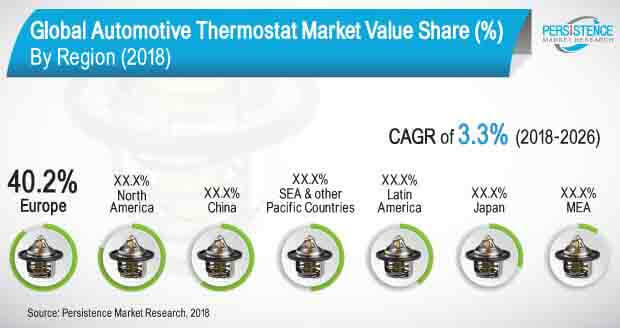 The report starts with an overview of the automotive thermostat market and provides market definition & taxonomy, along with the value chain, pricing analysis, drivers, restraints and trends in the market. The sections that follow include the global automotive thermostat market analysis by thermostat type, by vehicle type, by design type, by sales channel and by region. All the above sections evaluate the automotive thermostat market on the basis of various factors affecting the market. Each section discusses the qualitative and quantitative aspects of the global automotive thermostat market. To give a brief idea about revenue opportunities by thermostat type, vehicle type, design type, sales channel and region segments, the report also provides the value of the automotive thermostat market, absolute $ opportunity and total incremental opportunity for each segment over the forecast period (2018 – 2026). For market data analysis, we have considered 2017 as the base year, with market numbers estimated for 2018 and forecasts for 2018 – 2026. To calculate the market size, the report considers the weighted average price of automotive thermostats based on the sales channel, such as OEM and aftermarket, across key geographies on a country basis. The forecast assesses the total revenue (US$ Mn) and volume (‘000 Units) of the global automotive thermostat market. To deduce the market value, the cost of each thermostat by design type has been considered. In order to provide an accurate forecast, we have started by sizing up the current market, which forms the basis of how the global automotive thermostat market is expected to develop in the future. Critical market data, including the base number and segment splits, has been devised through in-depth secondary and primary research. This data is then triangulated on the basis of different verticals by considering supply side as well as demand side drivers and other dynamics of various regional markets, along with primary interviews of manufacturers and industry experts operating in the global automotive thermostat market. The forecast presented in the report evaluates the actual cost of the different types of automotive thermostats and the cost as per brands in the global automotive thermostat market over the forecast period. An automotive thermostat is a device used to heat up an engine quickly and then, maintain it at a constant temperature, which is accomplished by regulating the amount of coolant that goes inside the radiator. When the temperature is low, the thermostat blocks the flow of coolant in the radiator and once the engine reaches its optimum temperature, the flow is released again. The average operating lifespan of an automotive thermostat is in between 8 to 10 years. The global automotive thermostat market is estimated to be valued at US$ 2,182.8 Mn by the end of 2018 and is expected to reach US$ 2,820.5 Mn by the end of 2026, with a CAGR of 3.3% over the forecast period. The global automotive thermostat market is anticipated to represent an incremental opportunity of US$ 637.7 Mn between 2018 and 2026. The demand for automotive thermostats is directly driven by the increase in automotive production in key regions such as SEA and Pacific, China and India, among others. Moreover, the disposable income of the global population has increased considerably in the past few years. Attributing to this, the demand for passenger cars and commercial vehicles has also ramped up. This is expected to be one of the prime reasons promoting the growth of the automotive thermostat market across the globe. Furthermore, the increasing focus towards e-mobility has raised eyebrows on concept hybrid vehicles. The demand for hybrid electric vehicles has witnessed incremental growth in the past few years, which is expected to further create opportunities for the augmentation of the automotive thermostat market in the near future. The global automotive thermostat market can be segmented on the basis of thermostat type, vehicle type, sales channel, design and region. On the basis of thermostat type, the global automotive thermostat market can be segmented into traditional thermostats, map controlled thermostats and housed thermostats. On the basis of vehicle type, the market can be segmented into passenger cars, light commercial vehicles, heavy commercial vehicles and hybrid electric vehicles. On the basis of sales channel, the market can be segmented into Original Equipment Manufacturer (OEM) and Aftermarket. Based on the type of design, the market can be segmented into single valve and dual valve. Significant regions covered in the report include North America, Latin America, Europe, SEA & Pacific, China, Japan, and the Middle East & Africa. The housed thermostat segment is projected to account for a 68.6% volume share in the global automotive thermostat market by the end of 2026, with a CAGR of 3.1% over the forecast period. By vehicle type, the passenger car segment is projected to dominate the global automotive thermostat market in 2018. The segment is estimated to account for a market value share of 68.7% by the end of 2026. By design type, the single valve segment is projected to dominate the global automotive thermostat market in 2018. The single valve segment is expected to account for a 68.6% market value share by the end of 2026. The OEM segment is projected to account for a 46.6% volume share in the global automotive thermostat market by the end of 2026, with a CAGR of 3.7% over the forecast period. From a regional perspective, Europe is estimated to represent 33.5% of the market volume share in 2018. The market is expected to increase at a volume CAGR of 2.8% over the forecast period. The sales revenue of automotive thermostats in Europe is expected to reach US$ 1,134.6 Mn by the end of 2026 with a CAGR of 3.2% over the forecast period. Market growth in China is expected to remain high as compared to the global average between 2018 and 2026.